This was the final project for the course CS 179: Design of Useful and Usable Interactive Systems. It required us to work on a team and apply our course learnings to the execution of a project from problem identification to “product” implementation (the course expectation was an interface without back-end functionality). My team’s first task was to understand the problem space for our project. Based on an earlier course assignment in which we identified “bugs” (problems) and “hacks” (workarounds), we elected to work on receipt management and generated a high-level problem statement for it. In addition, we made a hypothesis about who our target population was, listed our unanswered questions and gaps in understanding, and researched the top competitors in this market. Then we conducted needfinding through contextual inquiry with our target population (consumers) and stakeholders (salespeople or business owners). We did this at two locations, Harvard Square and Porter Square, in order to mitigate bias from a heavily student-populated area. We also did secondary research online to uncover stories from our target population in blog posts, which we hoped might further mitigate bias from the Cambridge area. 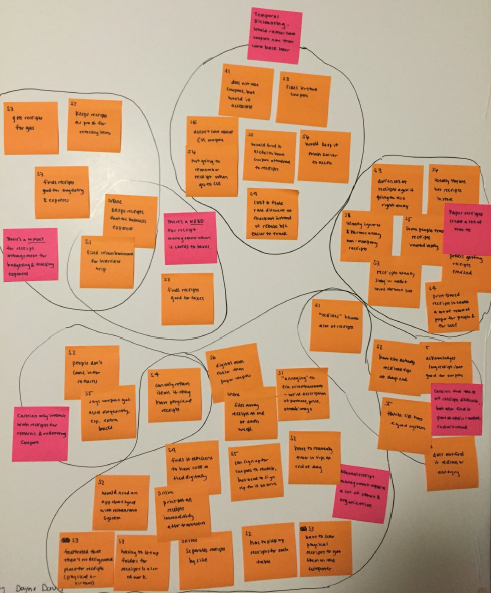 Using this research, we created an affinity diagram. We wrote down our raw observations on post-it notes and grouped them together into several categories. Our insights revealed that physical receipts generated either significant manual work for organization or immediate waste that reduced future opportunities to save money through returns and coupon redemption. In addition, having validated our target population, we created personas based on our participants for three different types of consumers we were designing our solution for: students, young professionals, and working parents. We took our insights and generated product concepts that we thought might enable these consumers to easily organize their receipts as soon as possible after purchase. For each concept, we created storyboards that we then used as stimuli to elicit quick feedback from many users. 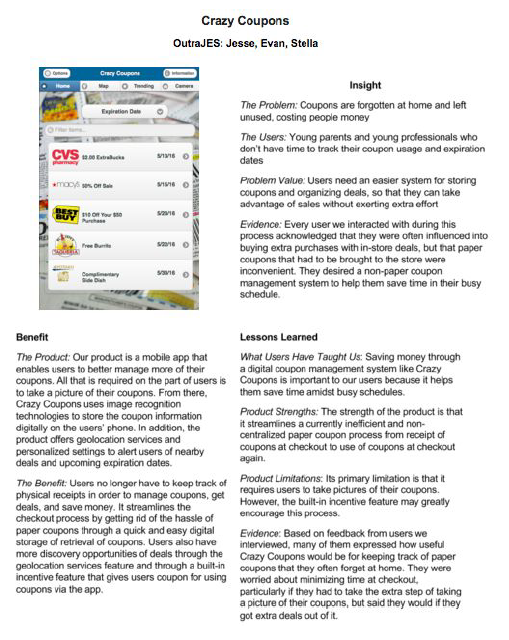 Synthesis of this feedback uncovered the greatest user value for the product concept “Crazy Coupons,” which was an app that would enable consumers to have quick digital access to their coupons without having to remember to bring physical receipts containing coupons from home (I was not responsible for its name). One challenge that emerged from this research was that it lacked incentives for users to use it. 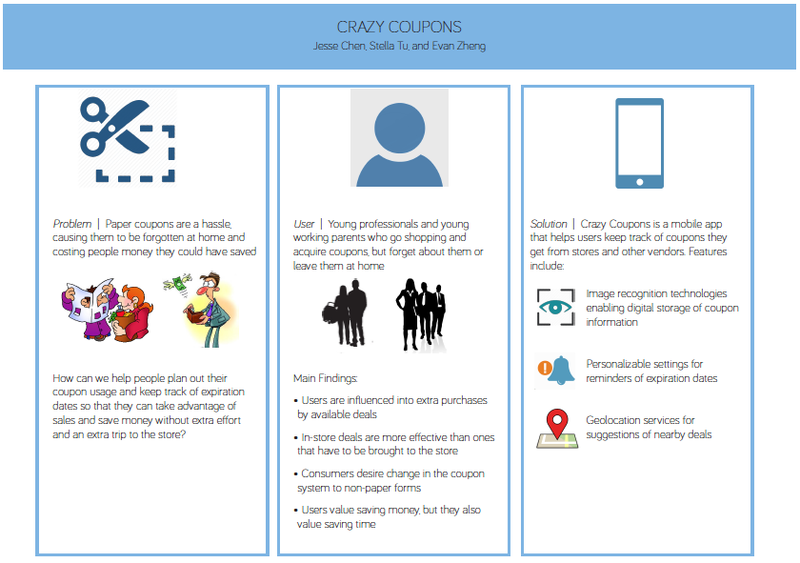 In response, we added a feature that would enable our users to earn coupons by using coupons with our app. Drawing upon my research and design experience from my internship, I created prototypes for two preliminary solutions in Axure and conducted prototype tests for each. Based on the findings, we identified the best features of each prototype and improvements to those features that informed a single solution to move forward with. We drew up a project plan to implement our product and divided up the responsibility for implementation among ourselves. I was primarily responsible for the navigation and visual design of the product. Once the product had been built, we created an evaluation research plan and carried out usability testing with our users. We made revisions to the product based on the findings of this research, and this was submitted as our final solution. We pitched our product to a guest panel to see if it withstood real-world parameters (which, given that it was a course project, admittedly fell under heavy scrutiny) and presented our project in a poster at an end of the semester CS fair (in which our peers were a much less scrutinous audience).